Contact State Bee Inspector, Jennifer Lund, for information about hive inspection, bee diseases, pests and their control. Jennifer is also able to give advice on good beekeeping practice’s, sound colony management, and licensing (which is required in the State of Maine, and is a good idea). 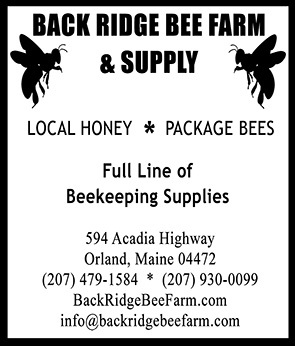 In compliance with the Maine Apiary Law (Specifically Title 7 MRSA Section 2701), notice is hereby given that all owners of bees must notify the undersigned of the number and location of colonies owned by them, and pay a license fee for the same. The license fee is due on June 15, 20XX in accordance with the fee schedule for all beehives in one’s possession (minimum fee $2.00). Failure to register bees as prescribed herein is a civil violation for which a forfeiture of not less than $1 nor more than $50 shall be adjudged for each colony in violation.